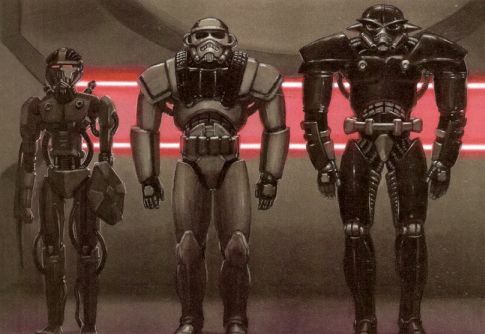 The Dark Trooper Type II was a strong improvement over the Type 1 when it came to sheer combat skill. Though slightly slower than its predecessor, it still manages to boast an impressive amount of firepower while maintaining its maneuverability. -Movement Sensor: (+2D to search for moving objects up to 100 meters away. -Proximity Detector: Detects any life form (or one previously specified) when it enters a 50 meter radius. -Basic Suit: +3D physical, +2D energy to resist damage. -Jet Pack: Adds 8 to move (already shown) when activated. Lasts for 1 hour, then must be recharged. -Self Destruct Mechanism: To prevent suit from falling into enemy hands. If unit becomes deactivated, then it will destroy itself after 1D rounds. Causes 5D/4D/3D damage. Requires a Heroic security roll to disable. Dark Trooper Type II: Walking 12th level Soldier; Init +6; Defense 23; Spd. 10m; VP/WP: 115/17; Atk +14/+9/+4 or +12/+12/+7/+2 or +8/+8/+8/+8/+3/-2 ranged (4d10 damage, Plasma Cannon), +12/+12/+7/+2 or +8/+8/+8/+8/+3/-2 ranged (4d10x2 damage, Missile Launcher), +16/+11/+6 punch (1d3+4, unarmed); SQ Damage Reduction: 5; SV Fort +11, Ref +8, Will +2; SZ M; Rep. 4; Str 18, Dex 14, Con 17, Int 8, Wis 7, Cha 4. Skills: Computer Use +2, Demolitions +3, Disable Device +2, Hide +7, Jump +6, Move Silently +7, Repair +3, Search +2, Spot +1. Feats: Armor Proficiency (light), Armor Proficiency (medium), Armor Proficiency (heavy), Cleave, Dodge, Far Shot, Improved Initiative, Lightning Reflexes, Point Blank Shot, Power Attack, Precise Shot, Quickness, Rapid Shot, Stealthy, Weapon Group (simple weapons), Weapon Group (blaster pistols), Weapon Group (blaster rifles), Weapon Group (heavy weapons), Weapon Group (vibro weapons).